You are a great teacher!! Thanks. Is there a password to get into the laser cutter computer? it’s written on the bottom frame of the screen. Thanks to @petra for a great induction! I learned a lot and cut my first piece. Does the laser cutter cut mother of peal, and can it be used to engrave/cut sheet metal? Laser cut/engrave mother of Pearl not sure. Cut/ engrave metal definately not. Have you seen mother of Pearl engraved before? Hi, does this include anodised aluminium? I’ve spoken to a laser tech who said engraving anodised alu was ok and have a project in mind. I can’t see it would do any harm really, but likely your milage will vary more dramatically than you’d hope. In truth, the restrictions are : 1) Nothing in the machine that will damage the machine (reflecty stuff) 2) Nothing in the machine that will cause a really unpleasant mess (sugar) 3) Nothing in the machine that will fill the space with toxic gas (Chlorinated plastics, Formaldehyde etc). I have heard of mother of pearl being laser cut and engraved. Does it have to be a special kind of laser cutter to cut or engrave sheet metal? To engrave sheet anodised aluminium is possible with our 80w speedy 300, to cut even thin sheet metals requires far greater power… raw metals engraving is not possible with this machine. I beg to differ! Now we have procured some Cermark this is pretty simple. I have so far managed successful metal engraving on Nickle and Copper, I’ll be giving it a go with stainless and brass next time the lasers free and I’m feeling motivated. The settings vary greatly from metal to metal, I had to go half the speed for copper as for nickle to get a comparable quality engrave. I would have uploaded pictures but at present I have no means. I’ll borrow a member’s phone next time I’m in the space. 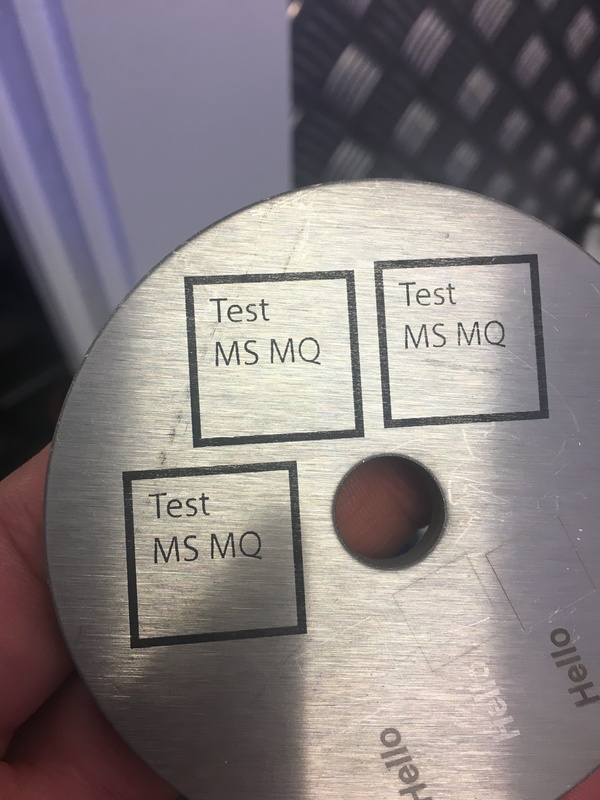 Here are some pictures of my testing with cermark spray on stainless steel. Hi, I’m now a member how do I go about booking an induction on the laser cutter?